Other known names are: Soldier crabs, tree crabs, climbing hermit, coconut crabs (althought these are not the real coconut crabs. Real coconut crabs can be quite large. ), ect. There are many types of land hermit crabs sold in America. 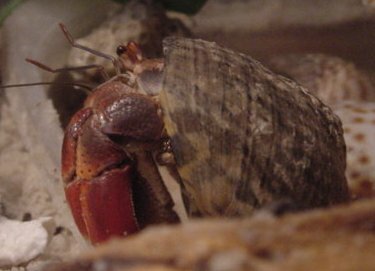 They are the: Reds or Purple Pincher (Caribbean) hermit crabs, Ecuadorian hermit crabs, Rugosus hermit crabs, Indonesian hermit crabs, Cavipe hermit crabs, and Strawberry land hermit crabs. This is Red, our PP. He is Baseball sized and a very gentle giant. Reds or Purple Pincher (PP) crabs have rounded eyes and more visible pores and hairs on their bodies than the Ecuadorians do. The Purple Pinchers grow to be much larger than Most other Land hermit crabs They come in a wide variety of colors such as tan, red and purple, Orange, Rust colored red, and some so dark that they look nearly black. The Purple pincher (or Red) has been known to live between 10-35 years in the Wild, but many do not exceed 4 years in captivity. The Purple Pincher has been known to be one of the calmest of hermit crabs. They tend to mosey around as though they are savoring each part of their day. The smaller Purple pinches can be more active, as they are in their youth, but they are still generally not as active as other types are, even within their age group. Here is Ray, a 4 inch E. Very gentle and loving, and loves to come when his name is called. The Ecuadorian crabs have more of an upside down teardrop shaped eyes (Or some say oval) and are usually more hyper active. They can walk just as fast backward, and from side to side, as they do frontward. They have a higher demand of salt water and are known to be much smaller than the Purple Pinchers (Reds) do. The most common colors of the Ecuadorian land hermit crabs range from grays, blues, oranges,reds, yellows, brown, and a combination of these. The Ecuadorians have a distinct mark on the back plate of their exoskeleton (I hope to get a picture up soon), and the Feeder claw is of a different shape than that of the Purple pinchers. The Pig Pincher (BP) of the Rugs have a simple design on them that is rather easy to distinguish. It is a lot like the E's only more pronounced. When the Rugosus hermit crab is within it's shell, you can see that it's outter back leg is more flat than the E's. Photo of Indie our Indonesian on the left, and Randy Rugosus on the right. Photo shows: Small orange Rugosus Petie (on the left) and Indie our Indonesian (on the right) sharing an apple. The Indonesian hermit crab is unique in itself. They do look a lot like the PP, or Carribean hermit crab, yet the eye stalks are brown or reddish in color. They have the same round, beedy, little eyes that we have all grown to love so much!Their exo is usually brown in color unless very young. When younger it is a more tannish color, somewhat like the PP's, only the PP's tend to be more pink or pale in color. The most distinct characteristic of the Indonesian hermit crab is it's Big Pincher. It is much larger than the other hermit crabs and more rounded. The color is a violet color for the larger crabs and usually tends to lighten near the lower part of the claw (thumb). They also have a flat outter leg on them as the Rugosus hermit crabs do. Indonesians are very calm and gentle, yet they do not tend to get as large as the PP crabs do.